Clicker is the proven English reading and writing tool that helps learners of all abilities to achieve literacy success. Clicker 5 Arabic Version has been designed to get learners understanding, speaking, reading and writing in Arabic. 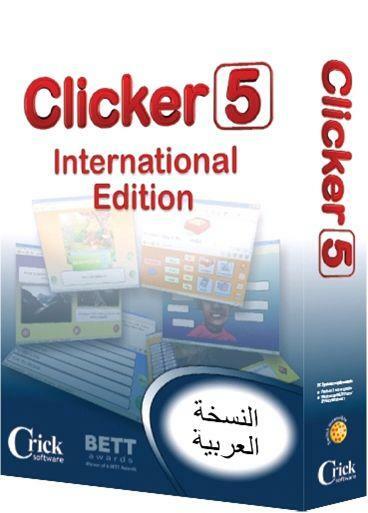 Clicker 5 Arabic Version contains 40 sets of high quality Arabic activities ready to use in your classroom. 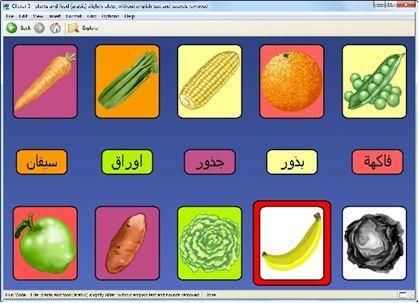 All the materials have been created by Crick Software's curriculum team and translated into Arabic by Mada (Qatar Assistive Technology Center). يحتوي كليكر 5 النسخة العربية على 40 مجموعة من الأنشطة العالية الجودة باللغة العربية جاهزة للاستخدام في فصلك. The software includes everything you need to create your own activities too. Arabic templates automatically set your activities to speak in a top quality voice, and provide a fully translated graphics library. ويتضمن البرنامج أيضا كل ما تحتاجه لإنشاء أنشطك الخاصة بك. قوالب اللغة العربية التلقلئية الجاهزة للاستخدام لانشاء نشاطاتك بلغة عالية الجودة ويوفر البرنامج مكتبة كاملة مترجمة بالرسومات. Based on the principles of Universal Design for Learning (UDL), Clicker offers a range of both curriculum and accessibility support to meet individual needs. Clicker is extensively used to help pupils who are learning to understand, speak, and write English.